Not so anymore: Every child has some dietary restriction that must be honored by everyone who comes into contact with them. Usually it’s an allergy or intolerance – gluten, or more frequently, peanuts. Sometimes it’s self-inflicted, as with The Child, who pronounced herself pescatarian at the age of 10 and never looked back. I have no problem with most of this by itself, but try adding it all together and then figuring out what to put into a child’s lunchbox. No PB&J (peanuts are completely banned at the school). Tuna is OK, but only once a week (mercury, you know). A bagel with cream cheese? Okay, but only sometimes. And so on, et cetera. I won’t bore you with the list of things I can’t put in the lunchbox with the sandwich. I don’t know who buys all that stuff in the snack aisle at Safeway, that’s all I’m saying. Then we discovered the Wonder Food: Nutella. It doesn’t violate any food rules. The Child will eat it – often. And you can add healthy things like bananas to a sandwich and they suddenly seem awesome, too. So now our pantry is filled with giant Costco jars of Nutella, which raise the inevitable question: What else can we do with this Wonder Food? 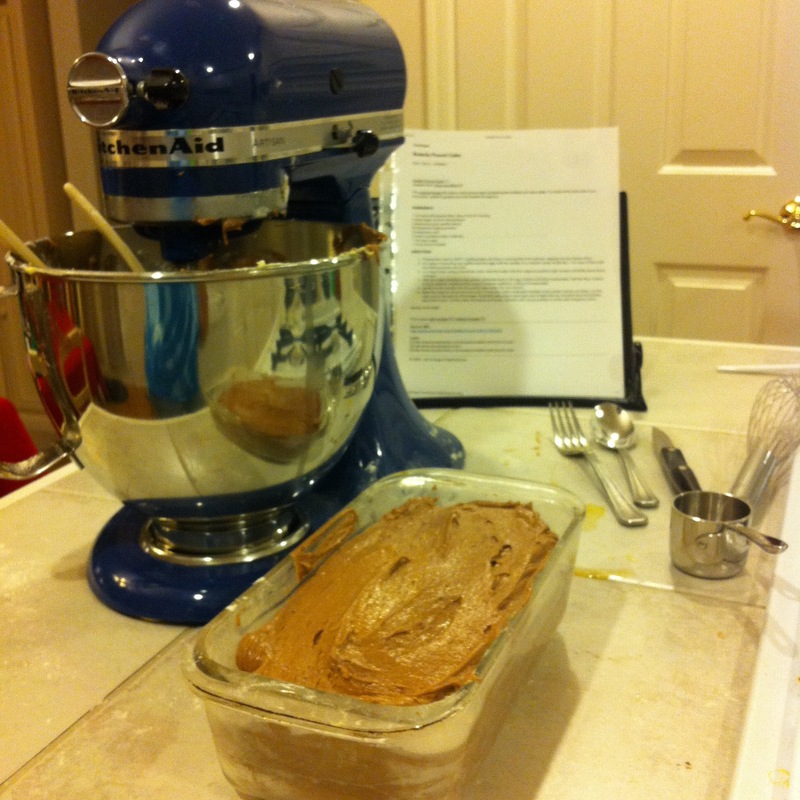 I was thrilled when I discovered this recipe for Nutella Pound Cake on Yumsugar. Sounds like a wonderful thing to make on a Sunday afternoon, then slice up and toss into a week’s worth of lunches. If it lasts that long, because – seriously – Nutella Pound Cake? Like that’s going to last a week in our house. And after I baked it about a half hour longer than I was supposed to, due to its refusal to be done, I gave up and removed it, salvaging what I could. It tasted kind of like brownies, but not quite. It was sort of tasty, but needed … something. No, we didn’t love it. But yes, we did eat it. It wasn’t possible to actually slice it, so we just kind of nibbled at it for a couple of days. I’m not sure what went wrong, but re-reading the directions, I think the pan I used was too small. I didn’t like it enough to re-try it in another pan. We haven’t given up on Nutella, though. We’re convinced there are many joys that await us with the Wonder Food. How could there not be? This is my contribution to Weekend Cooking, hosted by Beth Fish Reads. 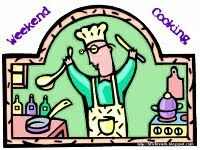 Maybe someone else had a better recipe this week – why not cruise on over and find out? Nutella is awesome! I have to say I was lucky with my kids growing up; they ate whatever I made for them. Too bad, the idea of nutella poundcake sounds so good. I bet it still tasted nice from a bowl. Maybe with ice cream? I can so relate to how your pound cake came out. Mine look like that or else they are hard as a rock and could be used as a brick. I loved your post (so I snuck down and read the Match.com Misfire one – hilarious!). The pound cake tried to escape 🙂 My 12yo daughter is a Nutella nut too! Too funny — okay, so the cleanup part was probably less than funny — the cake that tried to escape. Bummer, because I think nutella pound cake sounds fantastic. I know what you mean about allergies. I’m not sure why there are so many these days. I developed a stupid peanut allergy sometime over the last few years. I’m not happy about it. Ugh – what a nuisance! My mother developed a late-in-life strawberry allergy. Very hard for her since she’s loved strawberries her whole life. Oh, that sounds yummy! I will definitely try that. Thanks for sharing your Nutella adventure. 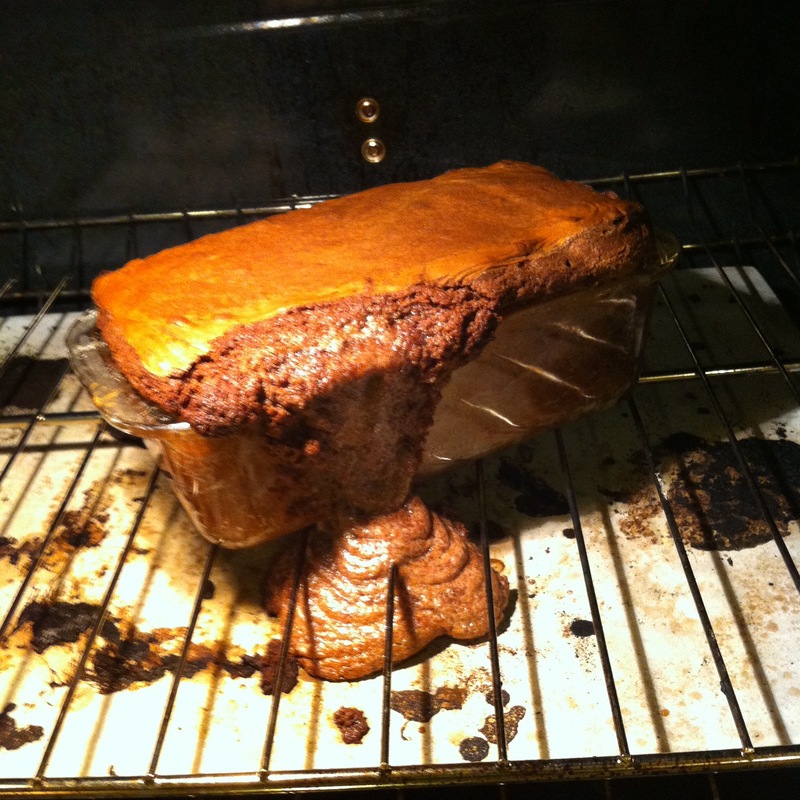 Sigh, there must be another pound cake recipe that will work better. Haven’t tried baking anything with Nutella yet, like to eat it straight out of the jar. I limit my consumption because the first ingredient on the label is sugar. Wow! What a mess. But a terrific experiment — thanks for sharing it with us! I am kind of surprised that hazelnuts are not also on your list of foods that have to be taken into consideration when considering allergies. My son is allergic and the way I found out was that I had been eating Nutella (out of the jar, as you do) and then I kissed him and his lips puffed up. As a result we don’t have nutella in the house unless he goes away for a few days and then I am down at the shop as quick as anything buying a jar that I will eat and make sure is out of the house before he comes back again. I’ve wondered about that because I know for some kids it’s just “nut” allergies. The Child’s peanut-free school is pretty small, so it’s possible they just don’t have a child with that particular issue at the moment. The Child is allergic to mold and penicillin and you’d be surprised how often we’ve had issues – with things like lake water (at summer camp). She inspects every bit of fruit, especially strawberries, before eating it. 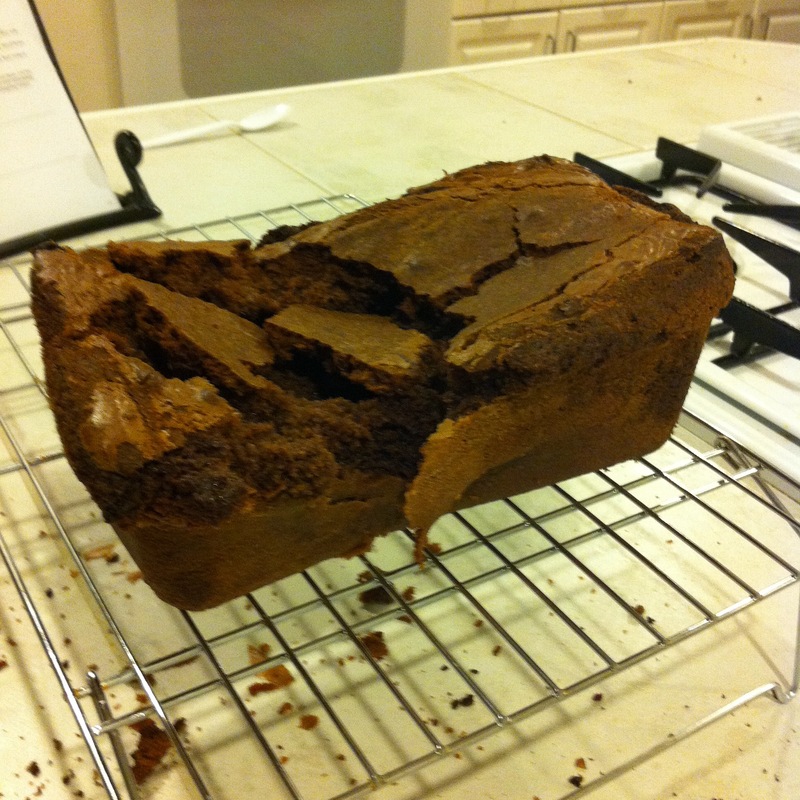 I love Nutella, so I am a little upset at the failure. But I know there must be a great, workable one out there………. … and we’re going to find it! Oh no! I hope you find the recipe that works. “It wasn’t possible to actually slice it” … LOL! This sounded so good, a shame the execution and final result wasn’t what you hoped for. Oh yes, The Child lives on Nutella and banana sandwiches! Groovy Girl’s school is completely peanut-free and it is a pain! I do have empathy for the parent’s of the allergic child but I repeat it is a pain to pack a lunch everyday for school. Lots of extra label reading goes into grocery shopping for said lunches. Nutella is wonderful and the pound cake idea sounds yummy. My dad loved cake in milk and that’s exactly what he would have done with this one. Cut off a big chunk, put it in a bowl, and poured milk over the top-I can almost hear his “mmmmm” sound. Love nutella. I haven’t baked within, but now I am taking this as a challenge to give it a try. I promise I’ll report back even if it’s. A failure.